In my mind, there are electronic dance music albums that are just that and then there are music albums that are electronic dance music. 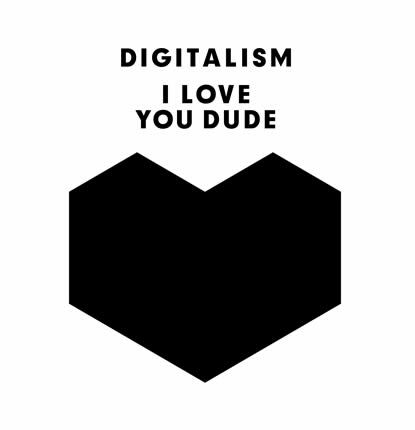 I Love You, Dude by Digitalism is definitely the latter. Digitalism is an electronic house duo from the city of Hamburg, Germany consisting of members, Jens Moelle and İsmail Tüfekçi. I Love You, Dude is their follow-up album to their idealistic debut, Idealism. Sophomore albums have a tendency to make me worry. Especially, when following a successful debut album and as in succesful, I mean a great listen for me. Probably one reason I really like this album and what Digitalism is doing is because there is more to their electronic music. They bring more of a punk element to the table and use lyrics in a lot of the tracks on I Love You, Dude. The album starts with the classic heavy drones of Digitalism in “Stratoshpere.” The song is a perfect instrumental build up into what is to come. They follow it with “2 Hearts” which showcases the duos talent to sing and well, talk together through a portion of the track. The third song on the album is definitely gaining popularity throughout the gaming community of the world as it is featured on EA Sports’ Fifa Soccer ’12. “Circles” is the name of the song and it has a way of making you want to play it again and again. This goes for the game, the song and the album. After two songs with lyrics they come back with “Blitz” another head bobbing instrumental track that gives your mind a break from having to digest too much information. Once you listen to the next song, “Forrest Gump,” you will understand just why it is called that. On “Just Gazin'” they do a great job of making you feel as if you are gazing off into a sunrise that causes you an ultimate euphoria. After you are placed in that peaceful state of well being the talented German electronic duo come back at you with the heavy hitting “Miami Showdown.” The second to last track, “Encore”, is another fun instrumental track on the album. It picks up momentum and at a point a couple of minutes in you get a picture in your mind of a crowd somewhere getting off of their feet. They close the album with “Harrison Fjord,” enough said. This entry was posted on Monday, February 27, 2012 at 7:27 am and is filed under Album Review, Music Reviews, Reviews with tags 2 Hearts, Antibiotics, Blitz, Circles, Digitalism, Encore, Fifa Soccer 2012 Soundtrack, Forrest Gump, German Electronic Duo, germany, Hamburg, Harrison Fjord, I Love You Dude, Idealism, June 20 2011, Miami Showdown, Reeperbahn, Stratoshpere. You can follow any responses to this entry through the RSS 2.0 feed. You can leave a response, or trackback from your own site.